These long lasting, cruelty-free soaps are crafted in a small farming community in northeast France by SEPA, a specialty soapmaker that has been making soap for the top perfumers of Paris for over 40 years. All Essence Soaps have a base of pure palm and coconut oils with karite butter to moisturize. 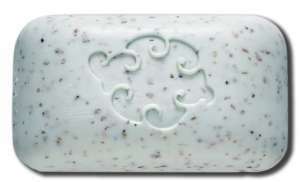 The soaps feature actual particles of the herbs and other natural ingredients in bars that are milled rather than poured into moulds. You can literally see the difference this process makes. A luxurious soap from France. Choose your favorite essence. Mix and match for quantity pricing. Sea Loofah-INGREDIENTS: Palm oil, coconut oil, water, sodium hydroxide, fragrance, seaweed, karite butter (shea butter), laureth 4 (creme). A mildly exfoliating soap with 8% seaweed from the coast of Brittany. Mint Loofah-INGREDIENTS: Palm oil, coconut oil, sodium hydroxide, fragrance, seaweed, karite butter, (shea butter), titanium dioxide, sodium chloride, vegetable glycerine, tetrasodium EDTA, iron oxides. Note: the color of the soaps will differ depending upon the variety chosen, photo shows the sea loofah soap.